Need materials for your research or class? Most of the public services librarians at Washington State University provide library instruction to campus faculty, students, and staff. Librarians who are subject specialists and departmental liaisons offer instruction in their respective subject areas. Some librarians also teach the Libraries' Accessing Information for Research (UNIV 300) course, and in collaboration with the First-Year Focus and/or English Composition programs. 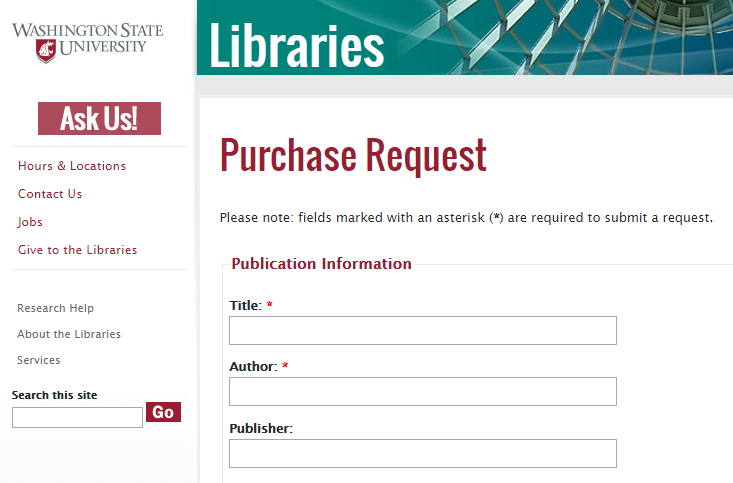 Click on the graphic below to request the library purchase an item for your research. We will do our best to make the resources you need available! A guide developed for an assignment requiring students to access geologic maps and other specialized geology-related resources. A guide developed for an introductory science class that incorporates resources for evaluating scientific information. A research guide addressing specific course requirements, including computing crimes per population unit and using the Uniform Crime Report. A guide highlighting books, journals, and Internet resources. A guide to help students begin their research projects through pre-search techniques, evaluation of sources, and identification of relevant books and articles. The WSU Libraries offers over 1,050 streaming documentaries through Alexander Street Press and Filmakers Library. Identify a video in The Filmakers Library database. For the enitre film, a new window will open displaying a persistent URL, and an embed code for the video. For a clip, a "make new clip" window will appear. Name the clip and select a "start" time and "end" time. Copy and paste the Permalink OR Embed code into the course management system.